George Grätzer, More Math Into LaTeX, 5th edition. Springer. 609 pp. Paperback, US$67.99. ISBN 978-3319237954. 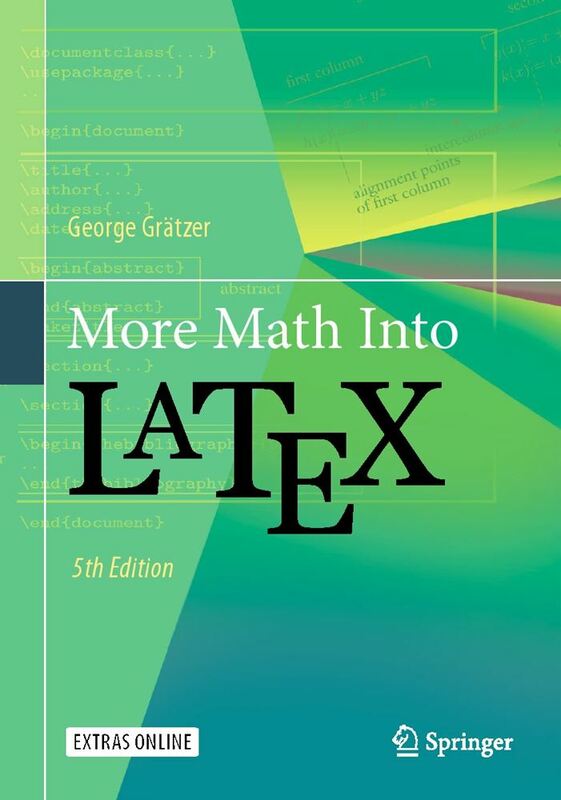 Although More Math Into LaTeX by George Grätzer is a classic, I happen not to have studied it. So with the appearance of the fifth edition, I grabbed the chance. I was not disappointed. The audience for this book is professionals such as working mathematicians or graduate students. The presentation is organized, thorough, and clear. The coverage is wide: certainly not everything about LaTeX is in here but it does cover, or at least provide a pointer to, the great majority of what an author would want to know to prepare a journal article, a book, or a presentation. A technical book must balance being an introduction against being a reference. Professor Grätzer finesses the question by having a first chapter called Short course. This gets a beginner up and running. The rest of the book is suitable for dipping into when you have a specific problem, although you absolutely can read it as well. This seems to me to be an excellent approach. Certainly if a graduate student preparing to write a thesis were asked to first master a six hundred page technical work, that would be discouraging. But here the short course is forty pages, eminently reasonable. The student could, in an afternoon, read the introduction, become familiar with the rest, and produce a first document or two. It is an approach that expects that the reader is busy working on something else and I suspect most readers will be grateful for it. More Math Into LaTeX has six Parts, and seven appendices. First is the short course mentioned above. Then comes the heart of the book, Text and Math. I’ll talk more about this below. Part III, Document Structure, discusses such things as front and back matter, and also the amsart class. Then Part IV on PDF Documents covers hyperlinks, and also includes a chapter on presentations and a chapter introducing TikZ. Part V on Customization covers writing your own commands, including list environments. Finally, in Part VI, Professor Grätzer discusses things most relevant to Long Documents, such as BibTeX and MakeIndex, as well as tables of contents, etc. The appendices include symbol tables for mathematics as well as for text, which I found useful almost immediately. I noted that contact information for the TeX Users Group is also included, with a suggestion that the reader may want to join. That’s great to see, of course. The longest Part of the book, nearly two hundred pages, and the one that will be the most often-thumbed is the second one, Text and Math. This Part also typifies the feel of the entire book. It is filled with information. The chapter names will give you a sense of the extensive coverage: Typing text, Text environments, Typing math, More math, and Multiline math displays. Just as one instance, there is a table with all of the font family switching commands. I can never remember the darn things and so right away onto that page went a sticky note, to ease finding it next time, in the heat of writing. This Part is also filled with examples. I find that in working with students learning LaTeX that they start from examples. The ones given in More Math Into LaTeX are ones that come up in practice, which gets these students started, and also conveys to them that LaTeX is something they will find useful. That’s very well done. Professor Grätzer also gives advice, tips. There are documents in the LaTeX world where in my opinion the author moves past suggestions and into intrusiveness. Not so here. While I didn’t find that every tip I read accords with my own sense of best practice, I did find that they are all reasonable. One thing about this Part, and about the book as a whole, is its good sense of where users have problems. Anyone who has spent time in online TeX forums knows that there are themes to the questions that people ask. More Math Into LaTeX does a fine job heading off these questions, before they become a frustration. There are many major LaTeX packages that the book does not cover. Just as one example, I’ll cite SIunits (http://ctan.org/pkg/siunits) as something that a person may well find useful in preparing professional technical documents and that I don’t find here. But no book can cover everything, and Professor Grätzer is wise not to try. The subject is just too extensive, and so this is not a deficiency. This is an excellent choice, for an individual or for an institutional library. It spans a great deal of the subject of LaTeX and does so without losing the reader. And, with this latest edition, it is up to date with recent developments. This classic continues on.